Have you ever thought of making your old TV wireless audio capable? 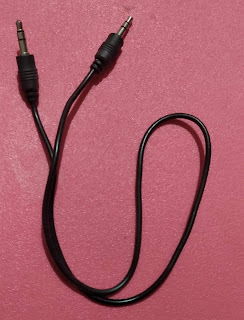 Wanted to connect your wireless headphone or a wireless speaker to your TV which does not support wireless audio streaming? You can do that with an additional device. Smart TVs have the capability to stream your TV audio onto your wireless speakers or headphones. But non-smart TVs does not support this feature. Just for the wireless purpose, you cannot change your TV, right?. Instead, make your TV wireless capable and connect any wireless audio receivers to your TV and increase your TV viewing experience. I will explain to you what are the devices you need to make your TV wireless audio capable, but before that, you should understand some terminologies. Most of the Bluetooth wireless audio devices like Headphones, Wireless Speakers are audio receivers. They are capable of receiving the audio signals through from a transmitter and they cannot transmit back. The audio sources like Smart TV, Computer, Mobiles, Audio Players are the Bluetooth audio transmitters. So, you are going to make your TV which a Bluetooth audio transmitter. For that, you need additional hardware. There are plenty in of them in the online market. Before getting one, check the specifications. The first thing you need to check is that its a transmitter and not a receiver. 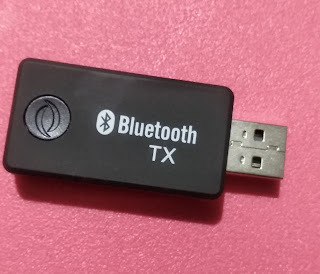 For example, if you want to play your mobile content on your car stereo, or any other AUX enabled speakers, you need to look for Bluetooth audio receivers. But in our case, we want to transmit the TV audio. Second, check for input and out options. That means, the device's input should match with your TV audio output. If your TV has 3.5 mm audio output jack, then your transmitter should have 3.5mm audio input options. 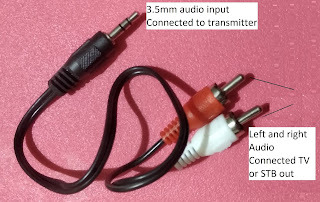 If your TV does not support the 3.5mm audio out then you have to go for the transmitter which has AV input. Every TV should have AV out and AV in. 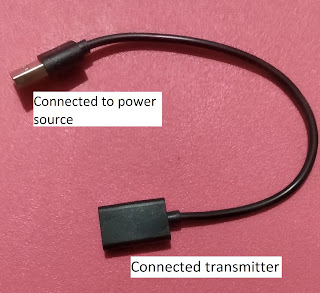 If your audio source is an STB, then you have to connect STB audio out to transmitter audio input. Then, the options available for the power supply. The device needs an external power supply. Generally, it will be a USB cable. If your TV has a USB port, use it for power supply. Otherwise, you can use any mobile wall charger which has a USB port. I just purchased one of the basic Bluetooth transmitters. It does not come with a brand name, though it does the job pretty well. I even tried with the Laptop and it works perfectly. It has all the options like USB power, 3.5mm audio input and AV to 3.5mm audio converter. My TV has USB and 3.5mm audio out close to each other. Used TV USB for power supply. 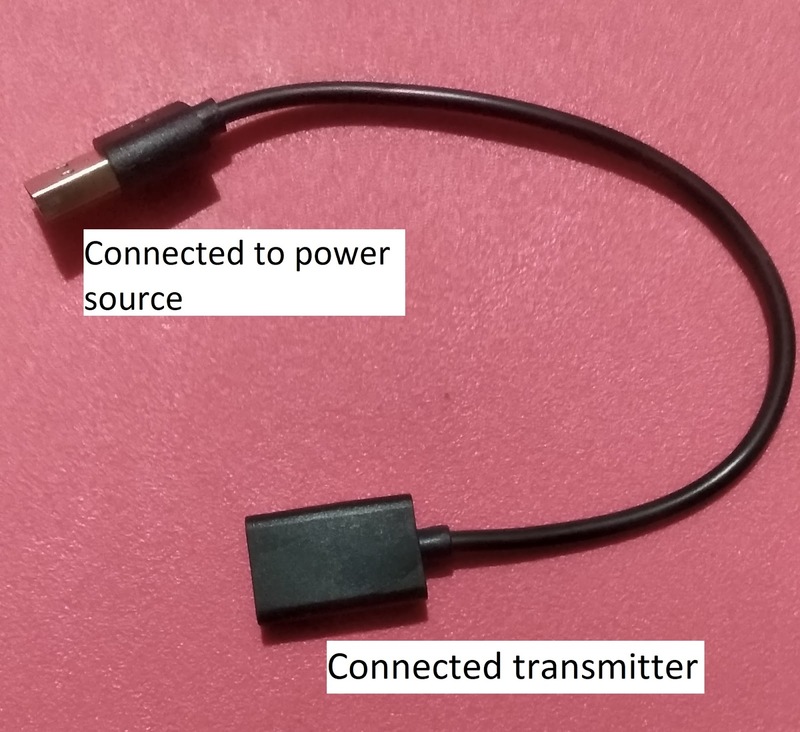 Connected TV audio out from 3.5mm to audio input of the transmitter. A lot of new features have been introduced in the WhatsApp recently. You may know some of them or all of them. I am listing here 4 new features that are very handy. Follow these steps to broadcast a message to multiple persons. On the home screen of WhatsApp, select CHATS, then click on 3 dots, which will display a menu. 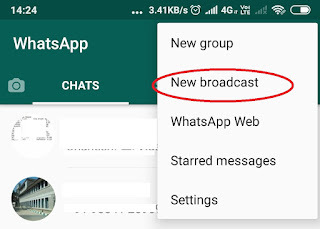 You will find a menu item called New Broadcast, click on it. In the next screen, you will get an option to chose the contacts to which you want to broadcast a message. 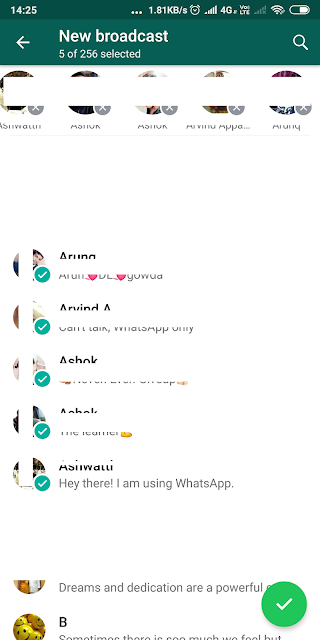 Select the contacts and click on the tick mark at the bottom to go the compose screen. In most of the cases when you press the ENTER key on your keyboard, it takes you to the new line. But in WhatsApp, you can configure it to act as a SEND button. That means, whenever you press the ENTER key, the message, which is already composed will be sent. 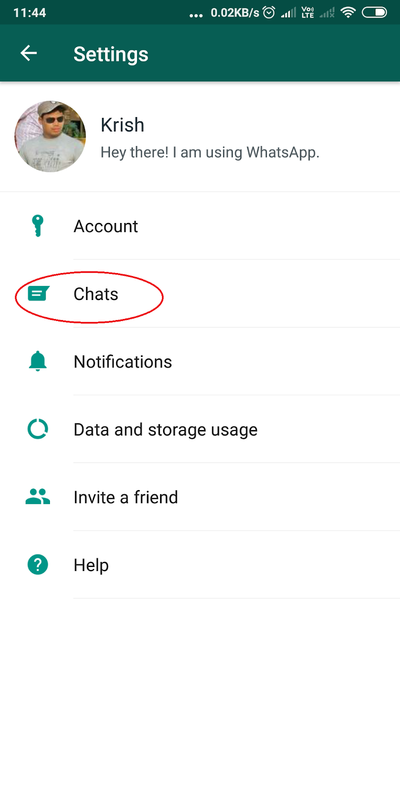 You can configure this in the CHAT settings. In the next screen, under Chat Settings if the box is checked, then ENTER will act as a send key. If you uncheck this box, then ENTER key will take you to the new line while composing a message. If you are sending a message to a single contact then you can easily see whether the message has delivered or not. You can also see if the recipient has read your message or not, provided, the recipient has enabled the REAS RECEIPTS. What if you are sending a message to a group, you still have an option to check who has read your message and whom and all the message has delivered. 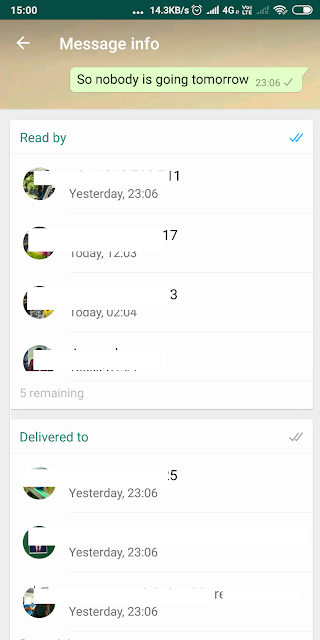 Select the message you have sent to a group by long pressing on it. Then click on the 3 dots at the top right corner, select Info. You will see 2 sections, one Read By and second Delivered to. This shows who has read your message and to whom all the message has delivered. We can use Excel VBA script to analyze a text file for a specific purpose. In this example, I have a text file which contains a list of files and their details like name, date created, file size etc. This is an extraction of DIR command in dos prompt. I am trying to find a text string "CNT" in each line and if it is present then I will extract the name of the file and store that in the Excel Cell along with the date the is created. I have hardcoded the column here, you can modify it however you want. The first column will keep the name of the file and the second column will keep the file creation date. If you are using excel for whatever reason then knowing these skills will definitely increase your productivity. These are not advanced but moderate skills. You can manage with excel without knowing these skills but knowing these skills will improve the proficiency in Excel. You can define a range as a table and give a name to it. Later you can use this name in a formula. You can also use these named tables in references. Under formulas menu bar, select Define names. Then give a name to the tables, for example, Sales. Then select the range and select ok. After you create the named table, you can use the table name 'Sales' in the formula to calculate the sum. Using autofill you can complete the series based on the current values. For example, if you want to fill multiple of a number, you can enter the first 2 number of the series and click on the autofill icon and drag down the column. In the newer version of the office, you will get multiple options. This will repeat the already available items, instead of completing the series with the next numbers. Completes the series with next values. It will ignore the values. Just copies the format of the existing cells. It can alternate the colors based on the selection. This will ignore the format but copies the value of the series. As you know Excel is a spreadsheet tool, the basic building block is a cell. Unlike any word processing tool, if you press 'Enter Key' it will take you to the next cell. What if you want to enter to a new line within the cell. You can do that by holding 'ALT' key and pressing 'ENTER' key. If you want to represent your data visually amazing, you can use data bars. It is very simple and it looks very attractive. The data needs to be of numerical values. This is one kind of conditional formatting. You can create a bar horizontal graph just by applying a conditional format. Select the range you want to apply the format. Go to Conditional formatting and select Data Bars. Under the gradient fill, select whatever color you want. Under the paste special you have options like transposing a the selected. That means you converted a row into column and column to row. You can paste only the formula, not the values. You can also link destination cells the source cell. By this, you can make sure that any change in the source will also get affected in the destination. Suppose you have a bank statement in PDF format. If bring the statement into excel you will have a lot of options to analyze it. One example would be a BRS, Bank Reconciliation Statement. Import the statement to excel and apply formulas on the imported statement. You can split the single line into multiple columns based on a specific delimiter. In the below example list folders and files has been extracted to a text file and it contains columns like date and time, type of the file and a name of the file and folder. Each of these columns can be split into separate columns in the excel. Once the data is in tabular form, it can be used for various analysis. In this case, you can sort the files based on their creation date or based on the names etc. 7. Autosizing a column width or row height. By clicking on the line between 2 rows or a column, you can auto adjust the width of column or height of a row based on the content of that column or row. Ctrl + Shift + Space: The First click will select the filled range surrounded be the current cell. Second space press selects the entire worksheet. I had created a macro to swap 2 cells values in MS Excel. By just clicking a button a macro could interchange the content of 2 excel cells. There was a limitation on that macro. It could only work only if the selection is just 2 cells. It could interchange the value of just 2 cells but not the ranges. I used to get a lot of request from my viewers to extend this macro for more than 1 cell. Due to time constraint, I could not work on it. Now, I have written another macro which will work on the Excel ranges. This macro is completely different. My original macro was based on area selection. But the new macro is based on the ranges. It is very small and easy to understand, unlike another macro, which is comparatively bigger. I will explain each of the lines in the macro. The first line is the subroutine name. The second line gets the string of value of all the ranges selected. The output will be "I23,H25,G22" format. It says 3 ranges are selected. Each range is separated by a comma. I will use this string later to get the ranges. Then, there is an if condition to check if the selection is suitable for our swap operation. It will not work as expected if we select more than 2 ranges. or less than 2 ranges. Our purpose is to swap or interchange the content of 2 different ranges. So the selection should be exactly 2 ranges. After this check, the selected ranges are stored in 2 temporary variables. The variables are converted to Excel ranges. This is very important, as we are not getting selection directly in the Excel range format. Instead, the selection is in text format. The string values should be converted into an Excel range object so that we can apply some Excel VBA functionalities. Then comes one more if condition to check if the selected ranges have the same number of cells. It is obvious that we should have the same number of cells on each selection so that we can interchange their values. This is actual swapping code. This is achieved through the temporary variables. Finally ending the if conditions and the Subroutine. Text manipulation is one of the great features of MS Excel. It has a lot of built-in functions to extract desired values from a text. By using different combinations of these functions we can create a complex formula. I have listed a few practical examples which are very useful. Extracting a Door number from an address text. I will use the LEFT and FIND functions to extract the Door number of an address. Here I am using the delimiter space (" "). The formula first finds a space character which appears after the door number. Then extracts the value whatever if at the left side of the first space. Suppose, from the below text I need to extract the dollar amount Which may be present anywhere in the text. For this, I will use multiple functions. For better understanding and for clear visibility, I have separated the functions. If you understand them clearly then you can create your own complex formula. First, identify the starting position of the Dollar symbol. The below data has names mixed with some other text. The left part does not have any unwanted text. So we don't have to worry about the left part. But the right portion has other text and we want to remove that. The text marked in red are to be removed. 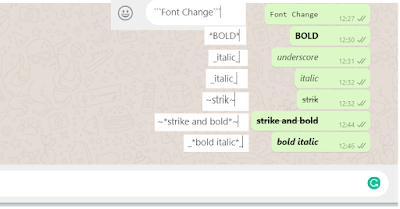 It is very clear that we need to extract the text up to the first "(" symbol. This is can be done using a FIND and MID functions. Note the -1 at the end of the formula. This is to exclude the "(" character. Because the FIND function will return the position of the "(". But we don't need it.